Currently, 4.3 million employees work from home at least half the time. But what do they call themselves? Remote workers? Telecommuters? Sometimes, it seems that the two terms are interchangeable, but they’re not. Learn what the difference is between remote work and telecommuting—and where exactly you fit into the equation. Even if you work from the comfort of your home office, you might think twice before calling yourself a telecommuter. It seems that the word “telecommuting” is phasing out in popularity—but definitely not in practice! According to 1MFWF supporter Global Workplace Analytics, 20–25% of U.S. workers telecommute at least some of the time. But the concept of telecommuting has been around for quite some time. Jack Nilles, a physicist and engineer, came up with the idea for telecommuting back in 1973. As he was designing space vehicles and communications systems for the U.S. Air Force and NASA, he realized how telecommunications could replace time-consuming commuting for this staff. He coined both the terms “telecommuting” and “telework” as he worked on projects that would allow employees to work at home. Generally speaking, telecommuting, remote work, working from home, and telework are all fairly synonymous. But there is a slight difference between them. Remote work implies that the worker lives outside of the geographic area of the company’s main headquarters or office. Telecommuting and telework can mean that there may (or may not) be some on-site work being done by the worker. And these days, not all work done at a distance is done from home—workers may opt to sit with a laptop at a coffee shop, coworking space, or an airport lounge if they’re a digital nomad. So while “work from home” is a common phrase, it might not actually be accurate in terms of describing exactly where people are really working. 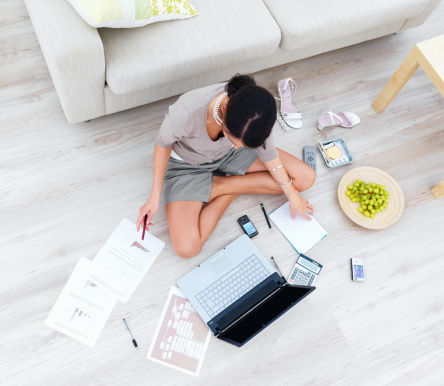 With the ability to truly work anywhere and still stay connected to the company, it stands to reason that telecommuting has seen a huge surge in popularity. Case in point: over the last decade, telecommuting has increased 115%. Interestingly enough, this statistic doesn’t include freelancers, who are expected to be about half the population by 2020—and will surpass it to 58% by 2027!. Due to this tremendous increase in telecommuting, you’re bound to find a plethora of positions if you do a search for remote jobs. In fact, FlexJobs’ remote job listings increased 51% between 2014 and 2017. Some of the career fields with the most remote jobs on the site include medical and health, computer and IT, education and training, sales, customer service, accounting and finance, and travel and hospitality. Since the idea for telecommuting has been around for decades now, it makes sense that new words and phrases would come to replace what is, in theory, a not-so-new workplace concept. In fact, some people prefer to use “remote work” instead of “telecommute” because it sounds more modern. That’s why these days, you may find “remote work” as a more popular search term if you are looking for a job with work flexibility. Just don’t exclusively use one term over another. If you’ve already got the flexibility you need, then it’s completely acceptable to use whichever term resonates best with you. Either way, please join the 1 Million for Work Flexibility movement to help ensure that whatever it’s called, we all get to do more of it! This post was very helpful. I’m hoping I get the results I’m looking for from now on. Using “Work at Home” as a keyword has definitely proven to be a target for scammer posts, in my experience. Besides being informative, this article was also educational and interesting. Thank you! Would you be able to provide an examples of job postings that use any of these terms in such discriminating fashion? I have trouble imagining that companies actually distinguish the terms knowingly. Pretty interesting! Always had that doubt about the difference and actually I thought it was the same. I’m currently in Mexico, working remotely from an American Company based in NYC. My company accepts remotely because we’re a travel company that encourages its team to travel .There’s a lot of information about being digital nomad and working remotely, but the true is that is perfectly doable and it works well! I wondered where the term telecommute came from. Now I know. My employer is using Home Based Employee or HBE to designate employees that are working from home. The HBE works at home the same as the full time employee in the office. We just don’t make the drive. If needed for meetings, we conference in. Otherwise, all work is handled via computer. I just moved from office employee to HBE and I think this may be a game changer for me. Remote working and flexibility helps businesses in savings on travel costs, increasing efficiencies in business processes, increasing productivity etc. Tools like R-HUB web video conferencing servers, WebEx, GoMeetNow, gotomeeting etc. are used for the same.